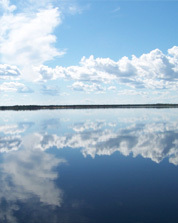 Thank you for our recent trip to Munroe Lake Lodge. 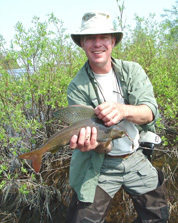 My family and I had a wonderful trip, great fishing, great guides and as always the food was Magnificent. Each of my children have been on previous trips to Canada and they agreed, which seldom happens, that this was the best, and your facilities and approach to business are unique. 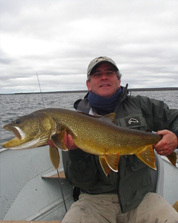 We met a group in the Thompson Airport who were in transit from another lodge, they were four of twenty four guests, caught very few fish and two trophies. We shared your story and our trip with them and they were impressed. They have your information , expect a call. Something for you to consider. 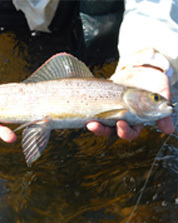 Your willingness to provide waders for our group was a great concession. It allowed us to carry less and for you to ship more. We were charged an outrageous amount to ship rod cases. On our return thru Winnipeg the agent gave us a break or the cost would have been obscene. Considering this is an ongoing , repeating and irritating charge, would you consider having rods available for us and we can provide all the rest including reels. 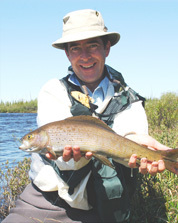 I am certain that you could purchase an array of rods ,including ultralight, for a reasonable amount and allow us to avoid this charge and hassle of transportation. Charge us a modest fee for usage with a damage fee for carelessness or accidents. You could cover your costs in short order, Make travel easier and cheaper, and remove this ongoing grievance. We hope you have a successful and rewarding season and hope to be seeing you again. SOON ! Dad and I had a great time, as usual, at the Lake this year. We absolutely love being there and seeing the both of you. Seeing the Northern Lights was a real treat for me. The 44-inch pike I caught in the narrows the evening of Aug. 10 is the first trophy-size fish that we have caught and landed on our own, without a guide, so it was pretty exciting. Thank you and we hope to see you next year! I am back to the hustle and bustle of the business world, but I wanted to take a few minutes to thank you both, along with your daughters and especially our guide George for a very special Manitoba fishing trip. 1 - 51”, 1 - 50”, 2 - 48”, 1 – 46.5”, 8 – 46”, 3 – 44”, 2- 42.5”, 3 – 42”, 5 – 41”. 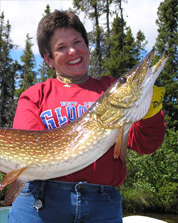 My total trophy Pike for the week was 27. 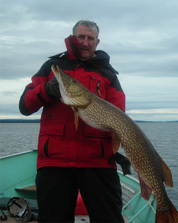 I have caught many trophy pikes through the years, but no trip comes close to my fishing at Munroe Lake Lodge. 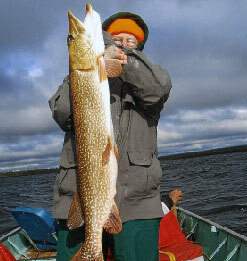 I look forward to seeing you next year and going for that 55” Northern that got away. Loved your place and hope to come back some time soon. Thank you for your hospitality. To have such a true family operation as yours is to be envied. I hope our trip pictures are useful to you. NO fisherman would believe the trip without them. were looking for the right place. We had found some with good fishing, but the accommodations were lousy, and good accommodations with lousy fishing. 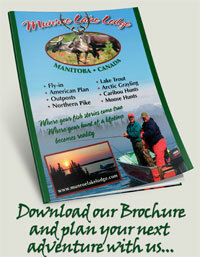 Munroe Lake lodge has both.Excellent food and fantastic service, and also great fishing. 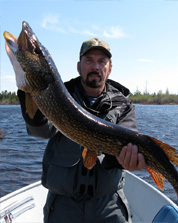 We have been on other Northern Pike trips, but never have caught as many what we call quality fish (35” to 40”). 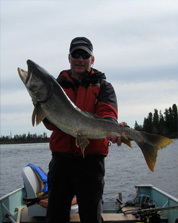 The Lake Trout were a bonus as we had never fished for them before. We were able to cast for them in shallow reefs (4’ to 10’). It was a blast! I think they fight just as good as large Pike. 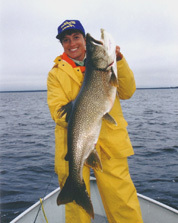 During the week, I caught a 37” and 38” Lake trout, both of which qualify for a Master Angler Award. We lost track of how many we caught that were between 28” and 34”.